To start, we barely found the place which boasted an address on Mainstreet but actually was around the corner, with the entrance half a block down 10th. Once inside the "supermercado" we found a sparse and clean looking taqueria with a magazine rack and some popsicles. Other than that, it was all taqueria, no supermercado, which was fine with us. The menu, at least what was written, had nine options: Tacos, Tamales, Burritos, Quesadillas, Enchiladas, Empanadas, Tortas, Sopes, and a Platillo con carne asada. The choice for us was fairly easy. We hadn't had tamales for the last two or three reviews. Check. 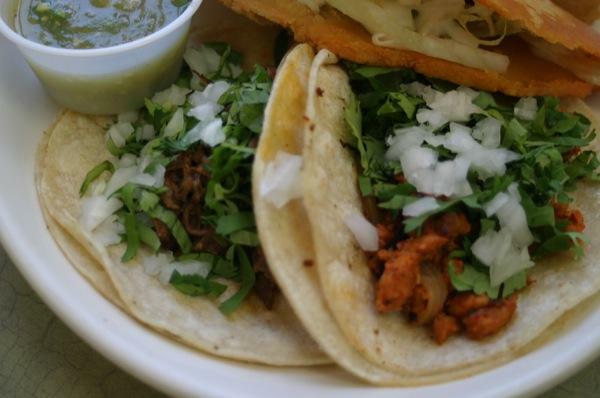 Tacos, as per the agreement in our article about Latin eateries in the Twin Cities. Check. Empanadas were an awfully interesting item on a 9 dish menu. Check. 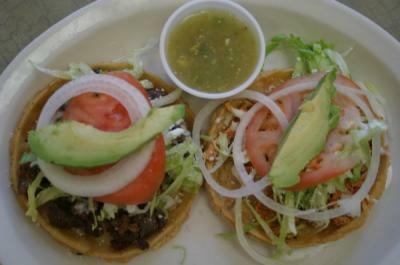 Sopes, why not, they are always one of our favorites. Check. We sat down, still amazed at finding this place and half dazed from the flurry of Spanish that we just tried to digest. You see, I made the mistake of ordering in half-Spanish and saying "gracias" too many times. Eventually the guy behind the counter just started speaking to me fully in Spanish and I kept nodding as if understanding every third word was enough. In the end, I knew that we had ordered something and that the bathrooms were upstairs. Don't ask me what the handwritten sign by the register said, I have no idea. Something about soup and meat. I think we may have missed an opportunity to try a special, but let's not dwell on missed opportunities. The other thing we noticed while waiting for our food was the woman working the tortilla press. As soon as she heard us order sopes, she went to work on some dough, first by hand and then with a press. We also got to watch her making tamales by hand a little later in the afternoon. This place was shaping up to be quite the little gem. We were really starting to wonder what the food would be like. Chorizo empanadaThe empanadas came out first, hot from the fryer and we could barely wait while I snapped some photos. These empanadas seemed unique right off the bat as they were quite good sized and sliced open on one side to look somewhat like a hard shelled taco (but not really at all like one.) They were supremely good and satisfying. We ordered one shrimp and one chorizo as recommended by the workers. 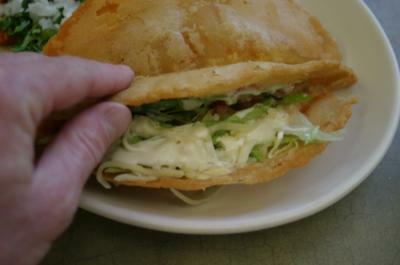 The chorizo one was filled with lettuce, sour cream, cheese and was a nice balance of hot, fried, spicy, meaty and cool, creamy, crispy, resfreshing. It was just delicious, especially because the chorizo was nice and peppery and not overly spiced. Did I mention it was greasy? Yum. The shrimp empanada made me a little skeptical, but I was cured instantly. 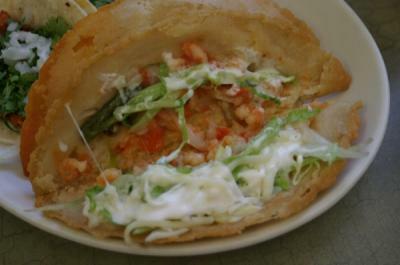 This one also had cheese, sour cream and lettuce, but added the kick of jalapeños with a tangy tomato sauce. It was so good and so different from the chorizo version. It really made us wonder about the chicken or cheese empanadas. So far, so amazing. I sampled the meat from the tacos, one with al pastor and one with barbacoa (pictured at top). The pastor was fine. It was light, tangy and a bit dry. There was nothing wrong with it to be sure, but it also didn't strike me as memorable. 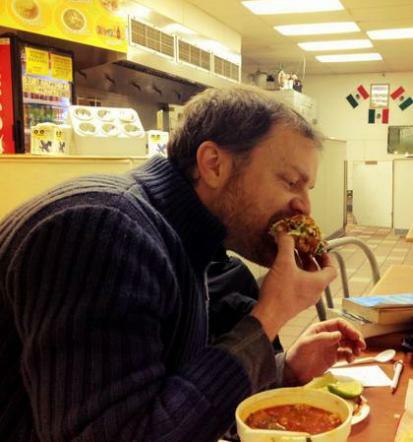 The barbacoa on the other hand was surprising and had me pausing to taste and think. Certainly there was some lingering smoke from the barbecue. There was also the great stew like flavor of beef cooking in its own fat and juices. Finally, there was something extra lingering in the background, quite mysterious. It could have been a guajillo pepper or a bit of clove. I'm no expert, but the barbacoa was certainly a highlight. Charles was meanwhile working on the tamales, one with jalapeño and cheese, one with pork in a red sauce and one with chicken. He seemed content and after trying them, I was reminded why we love tamales. They are sweet, savory and easy to eat. These in particular were made with a fine white masa corn that was quite wet. They were extra full of meat, which is not my favorite. I prefer a finer balance. For this reason, the raja (jalapeño and cheese) tamal was my favorite. It contained pickled peppers, tomatoes and some non-melty cheese, which was excellent as the texture was more like tofu or a cheese curd. It was very good. The pork was mixed with a light adobo sauce and was fine. The chicken was a bit dry, but again, there was nothing wrong with it and if I were stuck in downtown Hopkins for the day, I would feel lucky to have any tamale options at all. Finally, we came to the sopes, with their handmade corn cakes. They were really nicely done and both the tinga de pollo and the carne asada were out of this world. As a matter of fact, the carne asada was so good, that I actually braved asking the worker what was going on. He shrugged as if it was no big deal and said that it was marinated in orange juice and seasonings and that he wasn't sure why we thought it was so good. He was grinning widely though. I was too. This carne asada was obviously well treated. It was so moist and juicy, so full of flavor and so tender that I might say it was some of the best I've ever had. Would it translate to the platillo? I have no idea, but with that corn cake combined with the onions, lettuce, avocado, cheese and sour cream, I was in some sort of tasty Mexican bliss. Maybe I'm easy or just really hungry. I don't care. It was good and it was just $3. The tinga de pollo (chicken) was also worth mentioning. It had that same smoky barbecue flavor that seemed to linger throughout the beef and it also had something else. Something reminiscent of mole spice and exotic peppers. It was great on the sope, but would also be excellent in a burrito or quesadilla. So, what would we go back for? I would absolutely have to order empanadas. They were far too good to pass on, and I have a feeling it doesn't matter what filling you choose. I would also order some sopes, specifically with carne asada. I think the small sign said they also had cecina (salted steak) which would be a good option. I was really wishing they had lengua. And what about the tacos? They were fine and I would definitely order a few if nothing else than because they are an excellent vehicle for the carne asada or barbacoa. Finally, don't forget to enjoy the salsa verde. It was excellent, sweeter than normal, with avocado. 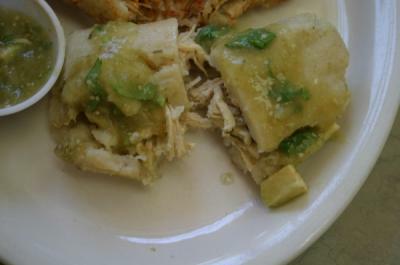 It was good enough to make me think that the Enchiladas verdes might be just fantastic. Happy eating. Surprise: Name, location, the excellent and real food, and REAL PLATES! Thank you for not using styrofoam. Language: Seemed like it was easy to communicate in English, but beware using too much Spanish if you are not ready! Payment: Cash or credit. Bring a few bucks for tip as they did not have a line for it on the receipt.